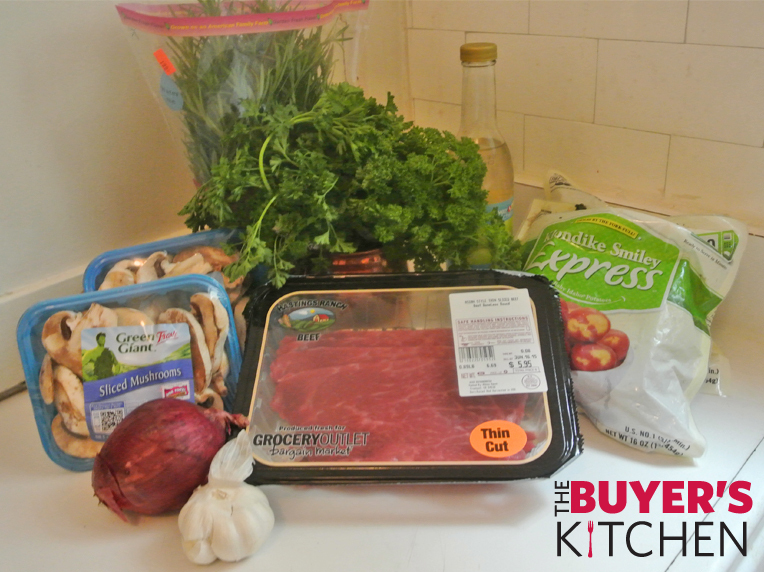 This dish features an Argentine staple, Chimichurri sauce! Say it with me “Chim-ee-ch-oo-rr-ee”. Chimichurri is a delightful tangy parsley-based sauce, which is never absent from any Argentine table when grilled meats are present. In this recipe, we’ve paired it with steak. Prepare the potatoes: If using the microwavable bagged potatoes, microwave for 1/2 the amount of time as indicated on the bag. 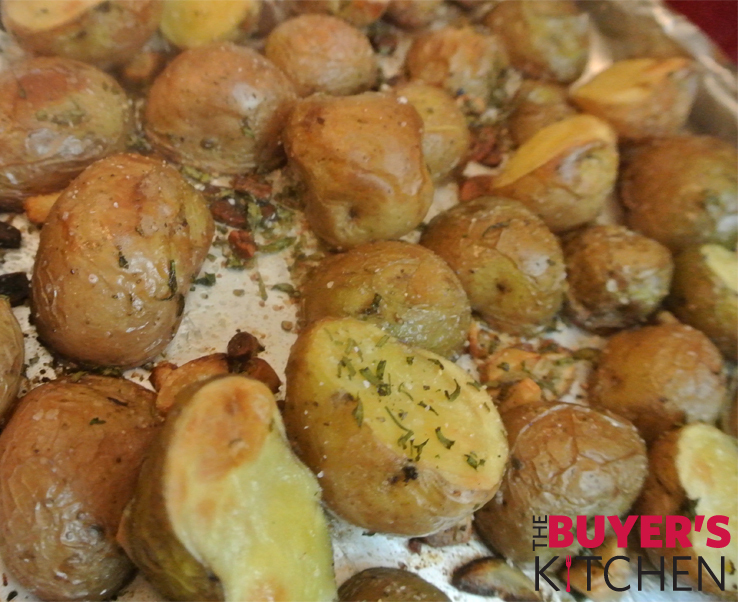 Once cooked, slice the potatoes in half and place onto a foil lined baking sheet. Slice 1/2 the head of garlic and mince the rosemary. Drizzle 3 tbsp of olive oil and add rosemary and garlic atop the potatoes. Toss with hands so all are coated evenly. Season with salt and pepper to taste. Roast for about 20-30 minutes until potatoes are golden and crispy. Make the Chimichurri: In a food processor or blendor add two bunches parsley with stems cut off, 4-5 cloves garlic, capers, white wine vinegar, and water. Blend on high and add 1/4 cup olive oil until smooth. 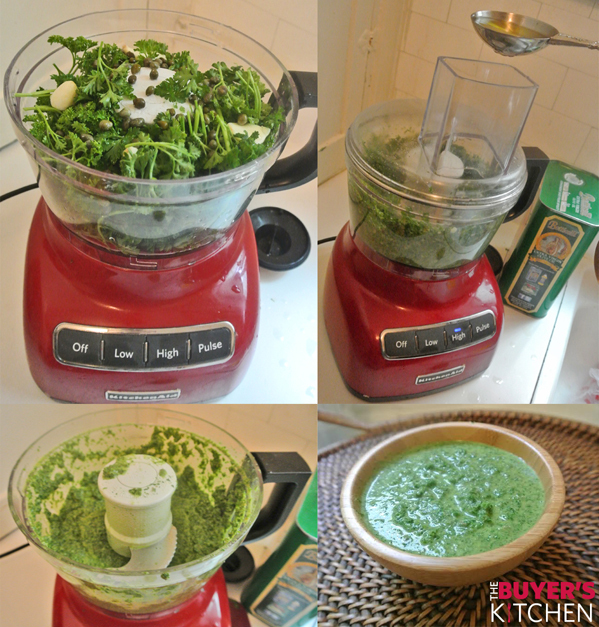 Consistency should between a pesto and a salad dressing (fluid with added thickness). Season to tase with salt and pepper. ***Keep leftover sauce in a container overnight, sauce should last up to 5 days after it’s been made. Grill Steaks: Season each side of the steaks with salt & pepper. Heat a large cast-iron skillet (or can be done on the grill). Sear each side of the steak for about 1 minute. Place into the oven to complete the cooking process about 4 minutes for thin steaks like these. 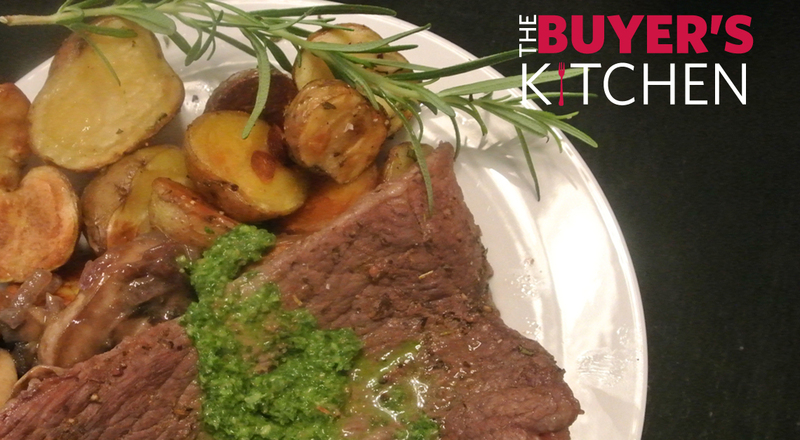 Plate & Enjoy: Serve the steak aside the potatoes and drizzle with Chimichurri sauce. ¡Buen apetito!